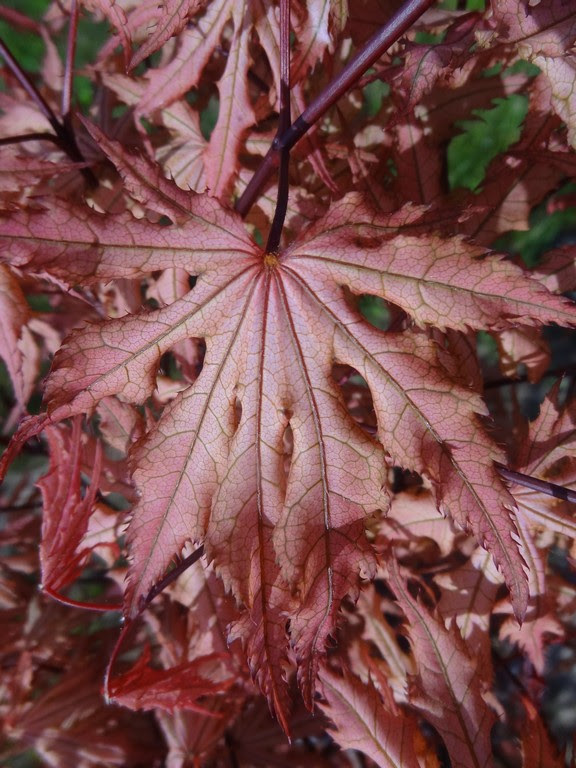 I have called the Hillier Manual of Trees and Shrubs (2014) my plant bible and it has been a highly useful publication for me, to assist with my understanding and appreciation of woody plants. 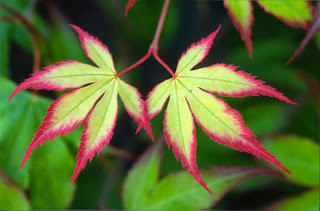 And, also of great value, by listing the various cultivars of the species it allows one to note the variations of shapes, colors and growth habits within a species. *Just in case we keep them separate. 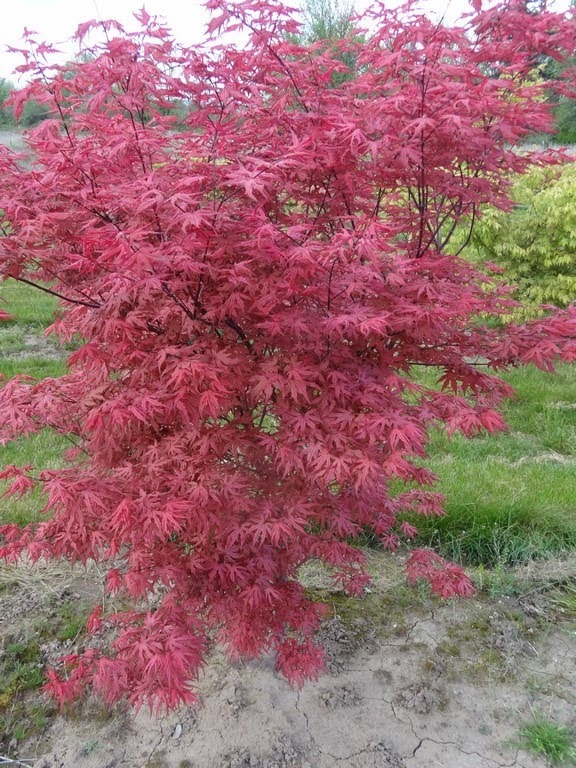 The second part of a Japanese maple name – or any Japanese plant name for that matter – should not be capitalized. 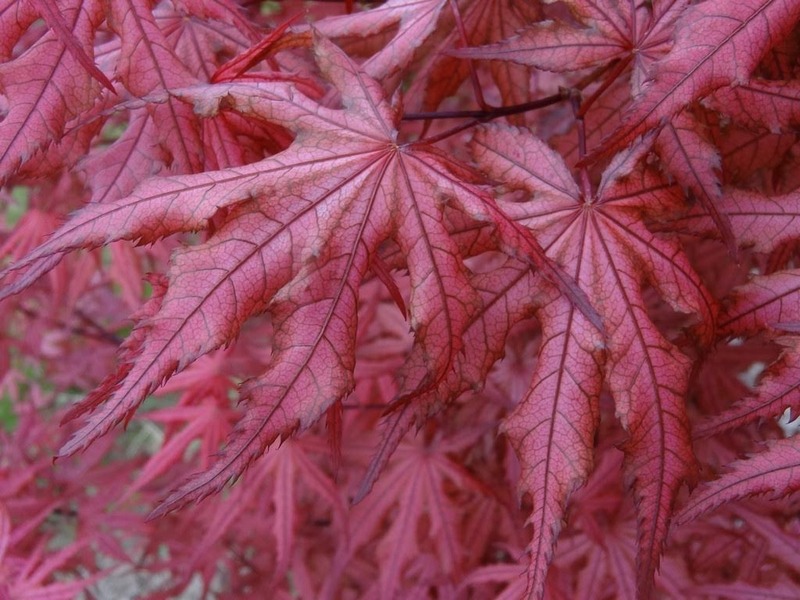 In English it can be, such as with 'Crimson Queen', but not for the Japanese 'Tsuma gaki', and Hillier agrees to follow this practice. One habit that annoys me, though, is the preponderance of dashes in the names, such as 'Shojo-nomura', 'Sango-kaku', 'Koto-no-ito' etc. 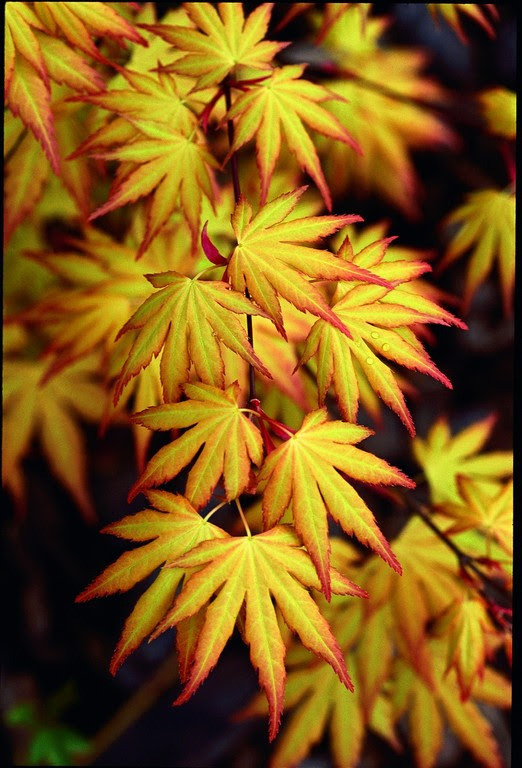 M. Yano in his Book for Maples manages many hundreds of Japanese maple names without ever once using a dash. Ditto with Maples of the World (1994) by the three Dutchmen: van Gelderen, de Jong and H. J. Osterdoom. So why are the English so predisposed to dash? Actually, Vertrees/Gregory employ the dash sparingly. But why 'Chirimen nishiki' (no dash), 'Beni kumo-no-su' (yes, partially) and 'Shigi-no-hoshi' (yes, completely)? Who is Mr. Dashing, the dash decider? 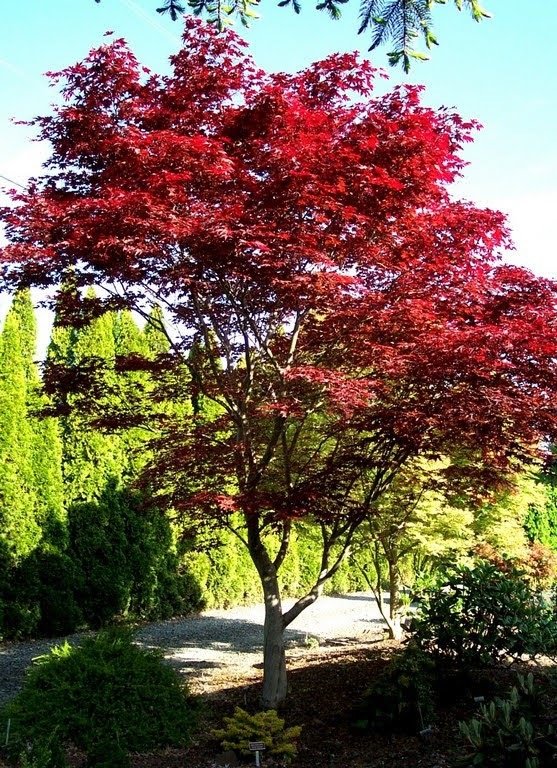 The Vertrees/Gregory maple tome (4th edition) is billed as “Revised and expanded to include over 600 plants,” but that includes some from species other than palmatum. 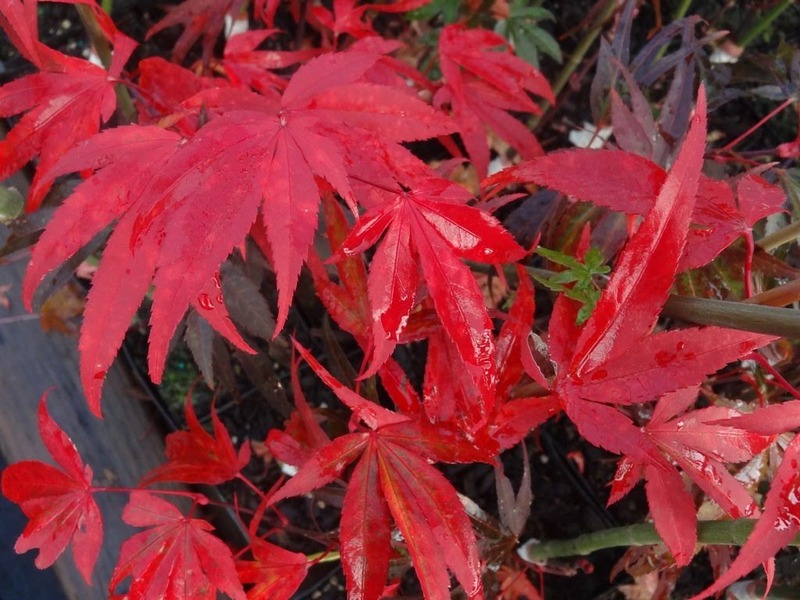 It must be a difficult task to narrow the palmatum listings to only 96 as Hillier does when there are over a thousand to choose from...and more on the way. 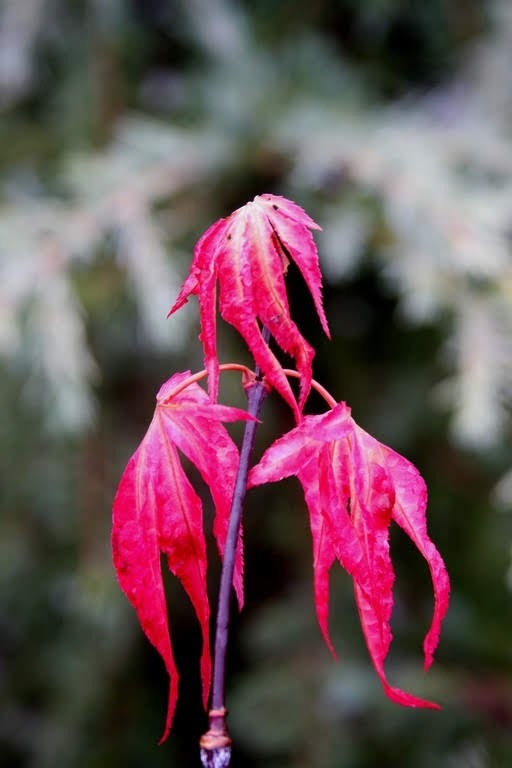 Many of Hillier's exist in older gardens and arboreta I suppose, especially those in Europe. 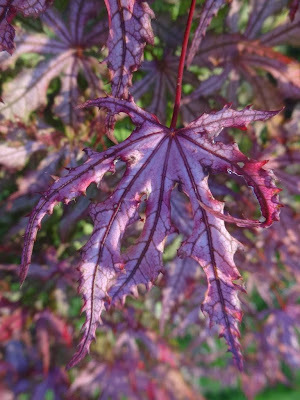 18 years ago at a Maple Society conference a Canadian botanist declared in a condescending tone that “Surely we have enough cultivars of Japanese maple.” I don't agree at all, because the gardening world doesn't really need the old 'Red Pygmy' which was selected in the Netherlands before 1969. 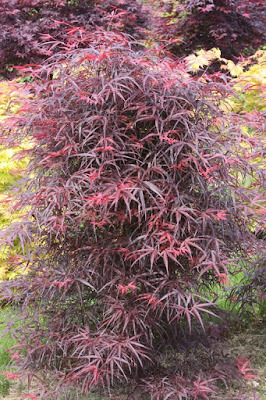 I would leave it off my top 96, and so too 'Linearlobum Atropurpureum' C 1881, in favor of the much improved 'Pung Kil' or 'Hubbs Red Willow', both introduced within the past 18 years. Hillier lists A. p. 'Aka-shigitatsu-sawa', but in the Vertrees/Gregory 4th it has been changed to 'Beni shigitatsu sawa' – and without the dashes in this case. Both aka and beni mean “red” according to my Japanese wife, but beni better describes what kind of red. 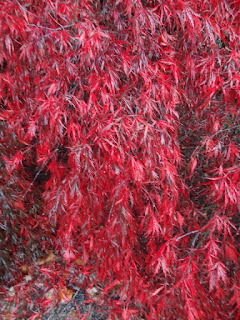 Vertrees calls 'Beni shigitatsu sawa' “the red-tinged form of 'Shigitatsu sawa'” and later states that “It is not as strong growing as its green counterpart.” I find the opposite to be true. 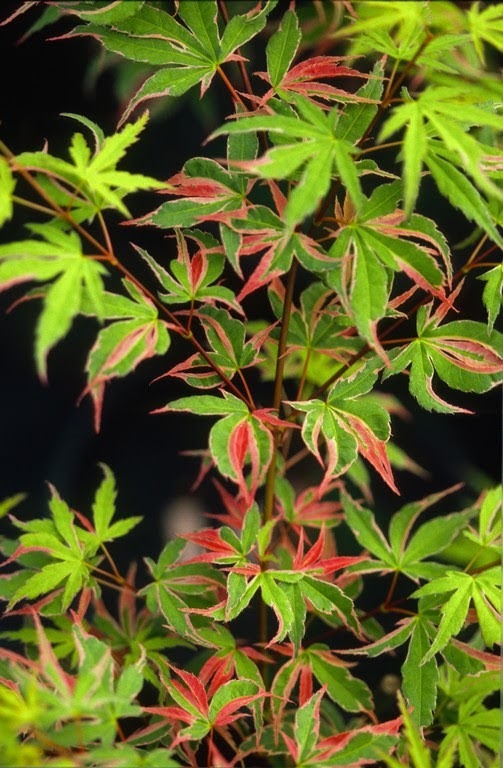 Also that it is “not easy to propagate and is rather rare in nurseries and collections.” It may have been rare in 1978 with the first edition of Japanese Maples, but certainly not difficult to propagate. 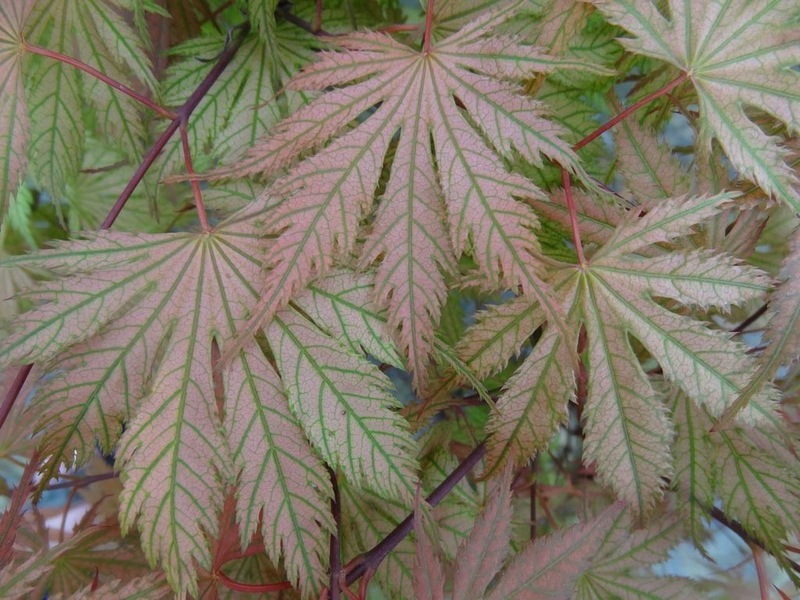 It is becoming “rare” again because it has been surpassed by better variegated cultivars such as 'Purple Ghost', 'Amber Ghost', 'Celebration', 'Strawberry Spring' etc. I keep one or two 'Beni shigitatsu sawa' on the place for old time's sake, but nobody requests it anymore, at least not from me. 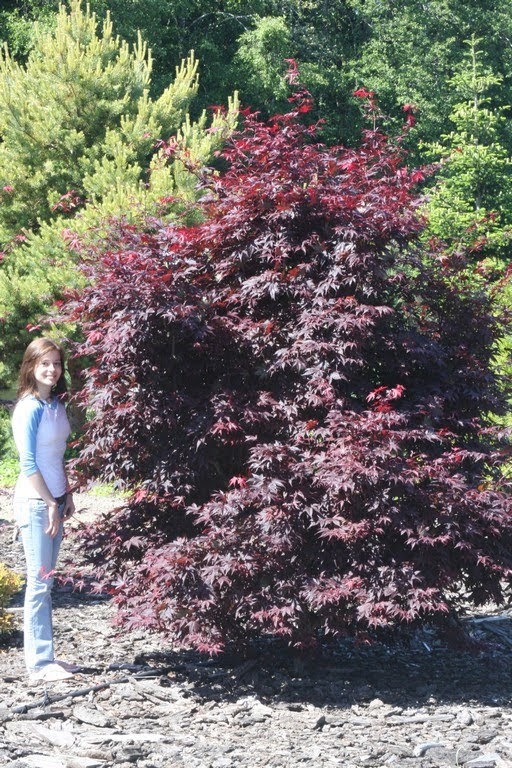 In Maples of the World, 'Kamagata' is called a “neat dwarf.” My original plant is now in a Virginia garden, and it is over 20 feet tall. The Vertrees [original seedling] stock plant, if still alive, is under 2 m in height at about 40 years of age. Yes, you would expect that the original seedling would not grow as large compared to my oldest being grafted onto vigorous green understock. This could be said for many cultivars, and it's why it is of no importance to describe size of the original, because everyone else will be growing something else, one grafted onto borrowed roots. I'm not just wandering around here describing Acer palmatum cultivars, so I'll reiterate this blog's theme: that I find Hillier's 96 to contain many old-world Eurocentric cultivars that I don't think are even in the trade in England – let alone America – anymore. Really, I don't care – I just find it to be a queer listing for 2014. 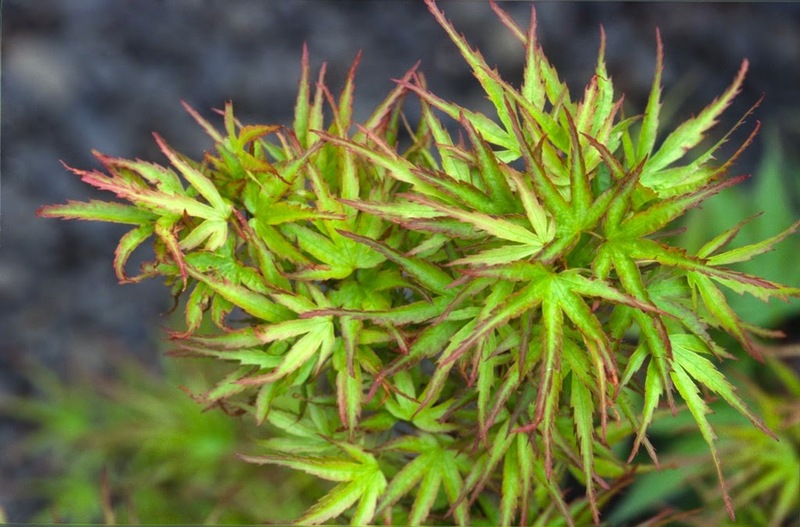 Even the Vertrees/Gregory publication of 2009, and especially the Dutch book of 1994 are quaintly outdated when it comes to descriptions of Acer palmatum cultivars. 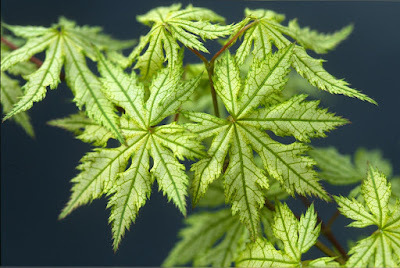 'Goshiki kotohime' is described as, “It is quite difficult to propagate because of the lack of vegetative growth. Scions for grafting are extremely short, offering less than 1 cm to work with.” Nonsense – if stock is held in a greenhouse, the plant can achieve 12” of new growth, and we normally get about 85% from grafting, and average 95% by rooted cuttings. Many of the 96 I totally approve, and Hillier lists one of my favorite cultivars, A. p. 'Ariadne', an introduction of Firma Esveld of Boskoop, The Netherlands. 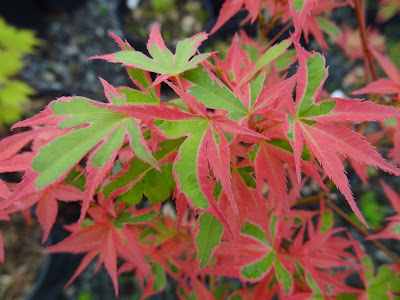 It was named after one of D. M. van Gelderen's granddaughters, and it is most lovely in early spring with pastel shades of orange-pink with conspicuous green veins. Sadly the coloration doesn't hold up for long. It doesn't burn, but it's just not as vibrant after the first month. It's worth growing though and I planted one close to our driveway so I could please my wife. 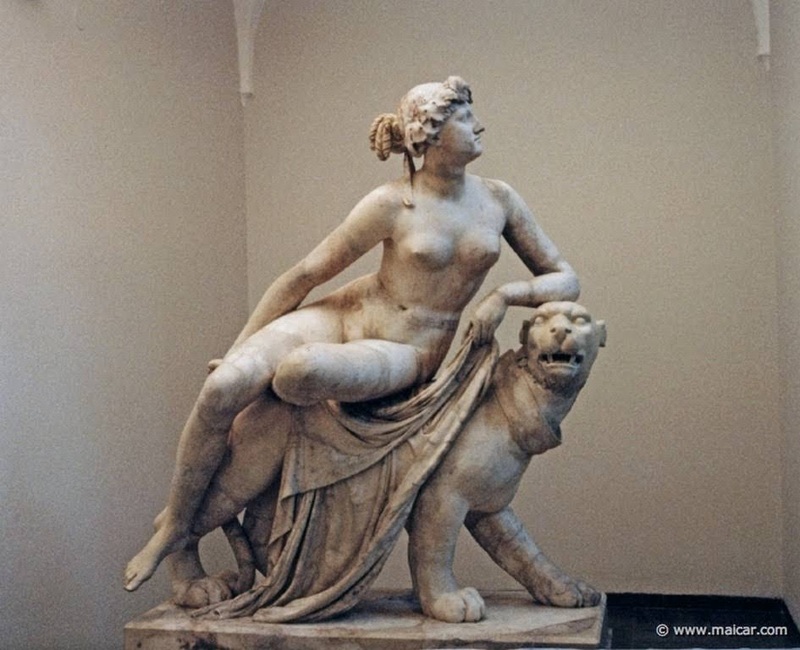 Ariadne is a more common name in Europe than America, for she was the daughter of King Minos of Crete and his wife Pasiphae in Greek mythology. 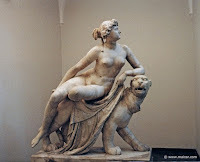 By her mother, she was the granddaughter of the sun god Helios. The Italian introduction of A. p. 'Orange Dream' (c 1990) should be included I think. 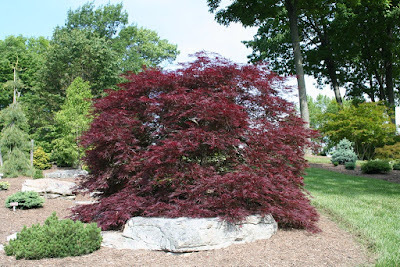 Hillier describes it: “Large, upright shrub with green shoots. The 5-7 lobed leaves are bright orange-yellow turning yellow in autumn.” I've grown many myself, but I'd like to see it in Hillier's England because in Oregon the “orange” part of the “dream” only lasts a few weeks – a fleeting dream indeed. At least by June any orange is gone, and even my old established tree in the Display Garden burns on the canopy top by July-August. 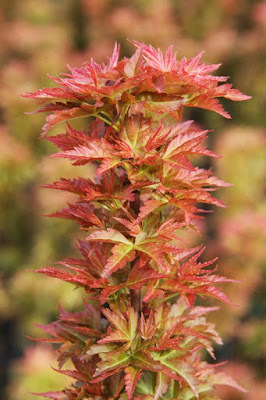 'Orange Dream' was introduced by Gilardelli Nursery of Italy. 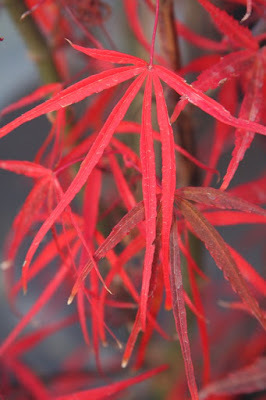 Vertrees compares it to the somewhat similar 'Katsura', stating, “However, it has proven to be less susceptible to drought than 'Katsura', but seems more difficult to propagate.” In my experience, grafting 'Orange Dream' is more successful than 'Katsura', and also I find it to be one of the easiest of all palmatums to root from summer cuttings under mist. Gilardelli Nursery also introduced A. p. 'Summer Gold', which is sort of similar to 'Orange Dream' except that the former is a much better cultivar, at least in Oregon, and that is because it is less prone to sun scald. It is not included in the Hillier manual, but it is in the older-published Vertrees/Gregory book, so I would consider that a serious Hillier omission. It would certainly make my top 96, and even be in consideration for my top 10. 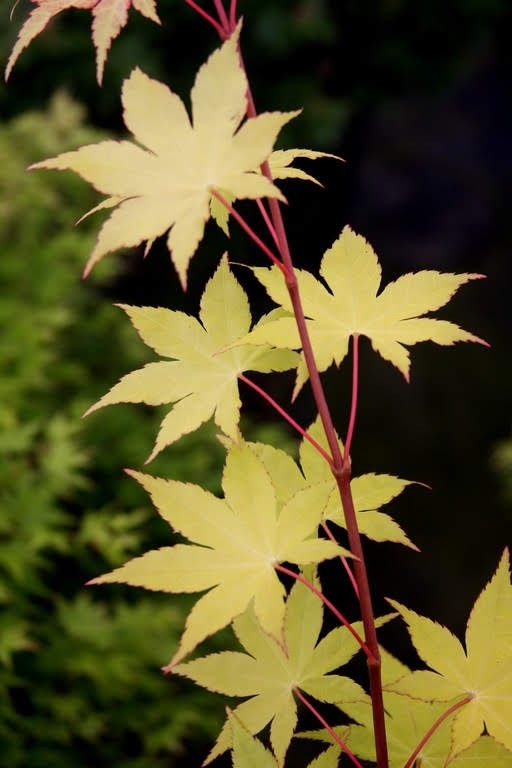 When I was first testing 'Summer Gold' I kept the main group of 6-7 foot containerized trees in the greenhouse, except for one that spent the entire summer outside in full sun. The greenhouse group grew larger, but the outside tree did well enough, even when we reached 100 F.
One more for Gilardelli Nursery, their introduction of A. p. 'Fireglow' made Hillier's list. It is described as “A vigorous large shrub with deep red-purple foliage. Similar to, but considered an improvement on, 'Bloodgood'.” That's an odd way to put it – on, 'Bloodgood'. I would have said over 'Bloodgood'. 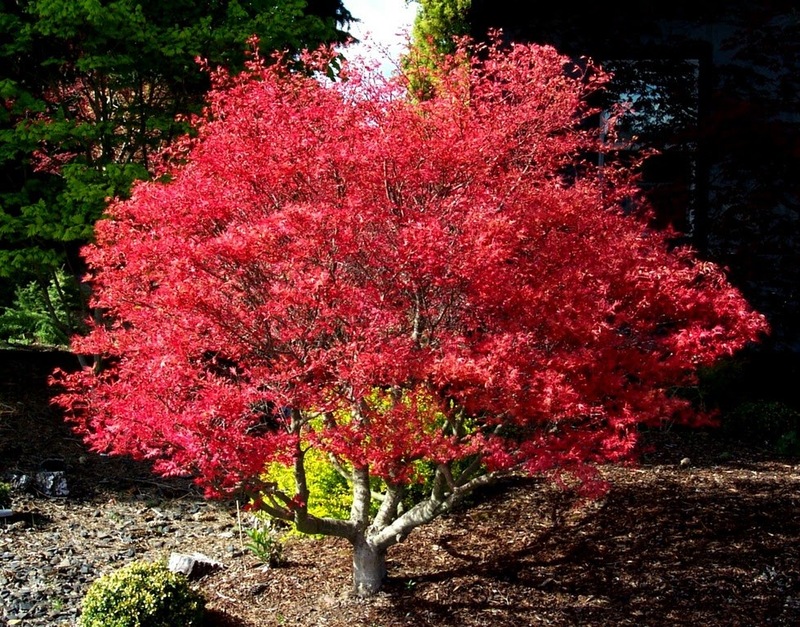 I have never thought of 'Fireglow' as a “large shrub;” I have always considered it a “tree.” And to call it an “improvement on, 'Bloodgood',” nothing mentions in what way. 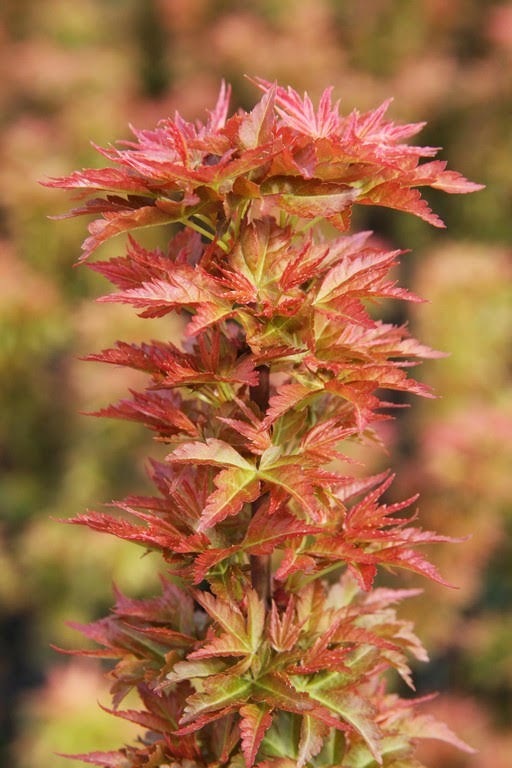 In my nursery you can grow a 'Bloodgood' to 6-7 feet a year faster than 'Fireglow', so the former is more profitable for the nurseryman. 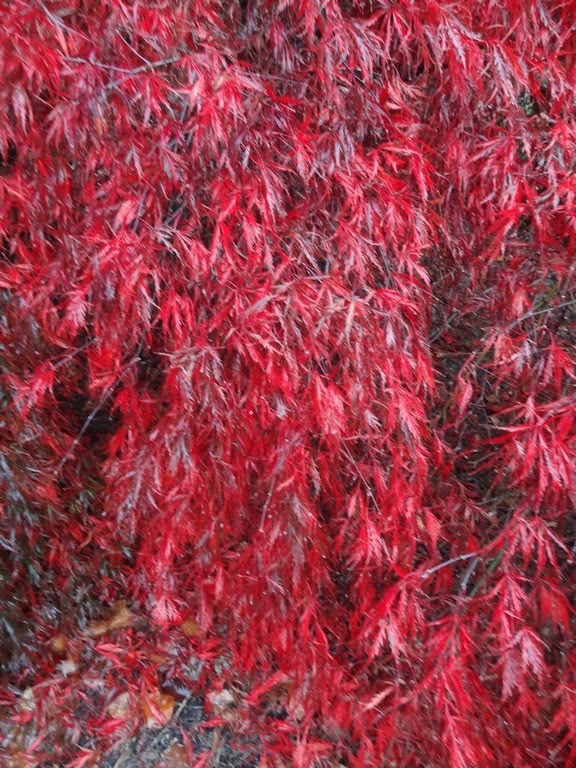 I'll admit, though, that if I could have only one in my garden I would choose 'Fireglow'. 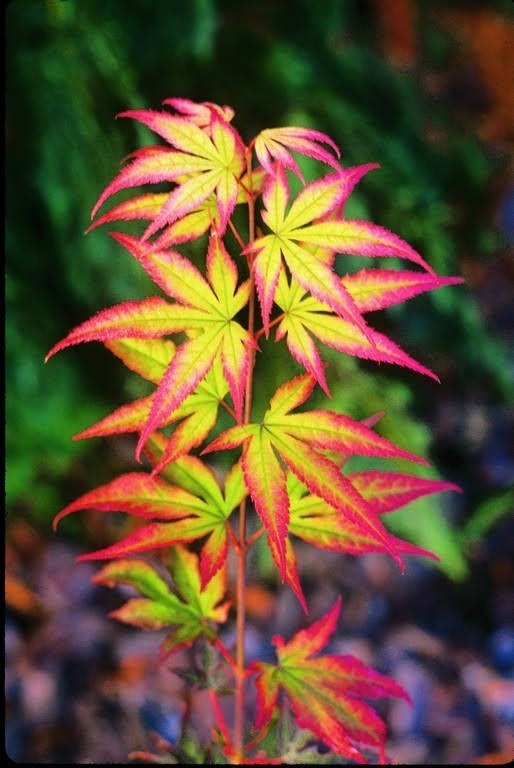 The purple-red of the tops of the foliage is about the same, but the aptly named 'Fireglow' is more impressive due to the color of the undersides of the leaves with the sun as back-light. They truly do glow. 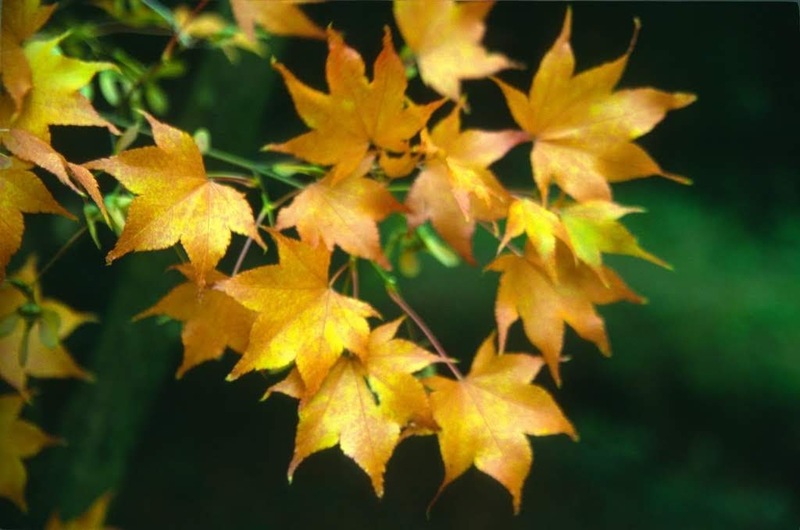 A. p. 'Lutescens' is in Hillier's book: “Leaves glossy green turning clear butter yellow in autumn. c 1928.” I like the cultivar but I don't grow it anymore...because no one would buy it, so it wouldn't be on my list. 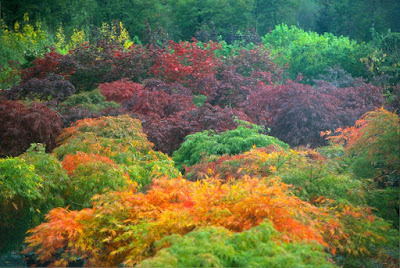 Also, one must be careful to describe autumn color. 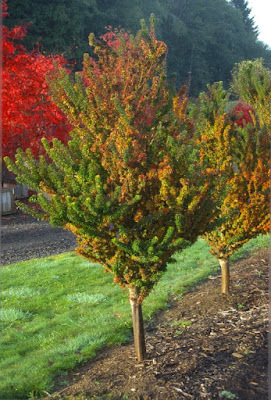 I grew a group of the new Parrotia persica 'Golden BellTower', a nice compact cultivar selected for golden fall color. Last year all 20 trees turned perfectly gold at one time. One was planted this spring at Flora Farm, and today the autumn color is yellow, orange and purple, same as the type. The same can occur with the maples. Some factors include water and fertilizer, container versus ground, the weather the previous summer, and probably for other reasons that I don't know. 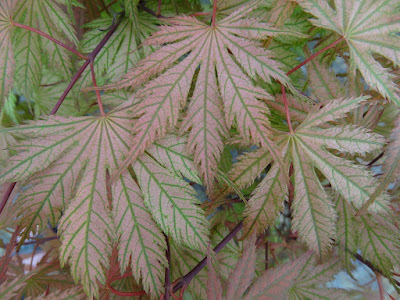 Of course A. p. 'Butterfly' made the list, “Raised in Japan before 1938.” It wouldn't make my list because the variegation looks “dirty” by mid-summer, and I much prefer the cleaner look of 'Shojo no mai' or 'Beni schichihenge'. 'Shojo no mai' does not make the Hillier manual but 'Beni schichihenge' does. 'Beni schichihenge' has been around since 1967, and its name means “red and changeful.” I've never seen red, only pink and orange. 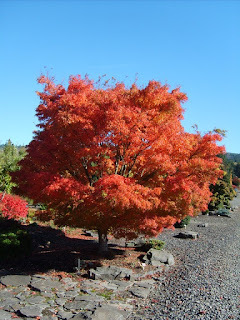 I once saw an 8' tree at another nursery that was in desperate need to be potted up. 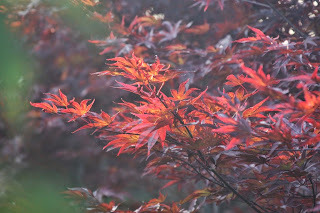 It was in May in California and I was stunned by the copious amount of orange in the leaves. 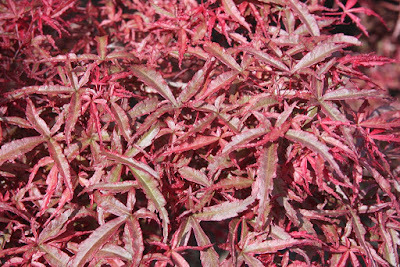 It didn't have much for new growth – it was struggling – but the color was fantastic. Sadly I was without my camera. Hillier calls 'Beni komachi' – well, 'Beni-komachi' – “A medium-sized shrub with leaves very deeply divided into 5 slender, curved lobes, bright red when young, turning red-purple then greenish-red.” I don't grow it anymore because it was prone to powdery mildew and it always reverted. The reverted growth had vigorous branches with larger leaves that looked like 'Shindeshojo'. You had to catch that early and prune it off, and ultimately I considered it too high-maintenance. For unknown reason the selection's (Japan, before 1930) name means “red mirror,” and sorry, it wouldn't make my top 96. 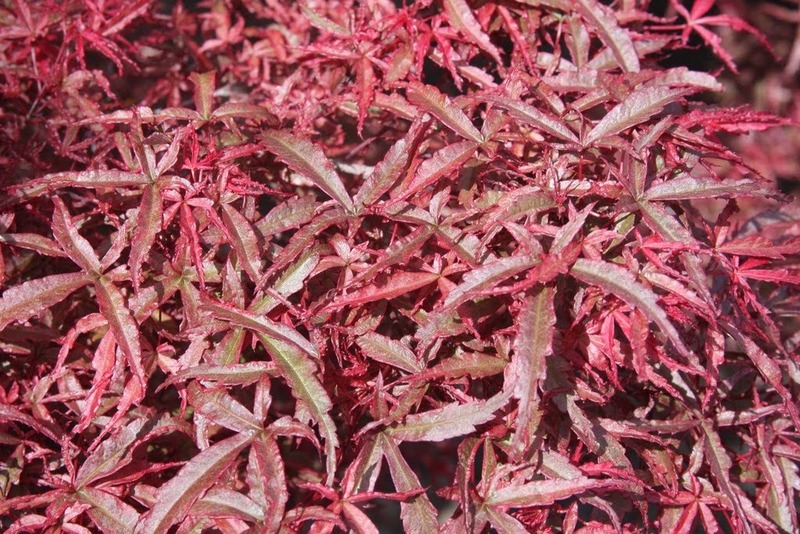 A red dissectum from New Zealand is in the top 96 – A. p. 'Crimson Princess' – but it wouldn't be in mine. 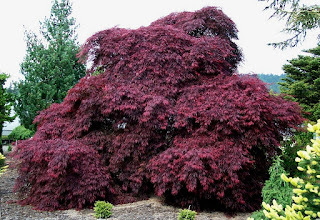 Hillier refers to it as “dwarf,” but I find it to be an unattractive, sprawling shrub. 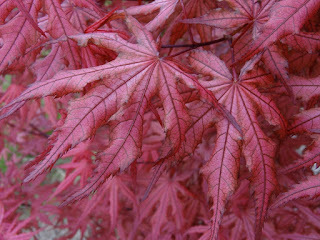 Its red-purple foliage is decent, but the form is untidy compared to the dome-shaped weepers such as 'Crimson Queen', 'Red Dragon', 'Tamuke yama' and others. I might still have one or two on the place, but we have discontinued propagation in favor of the aforementioned. 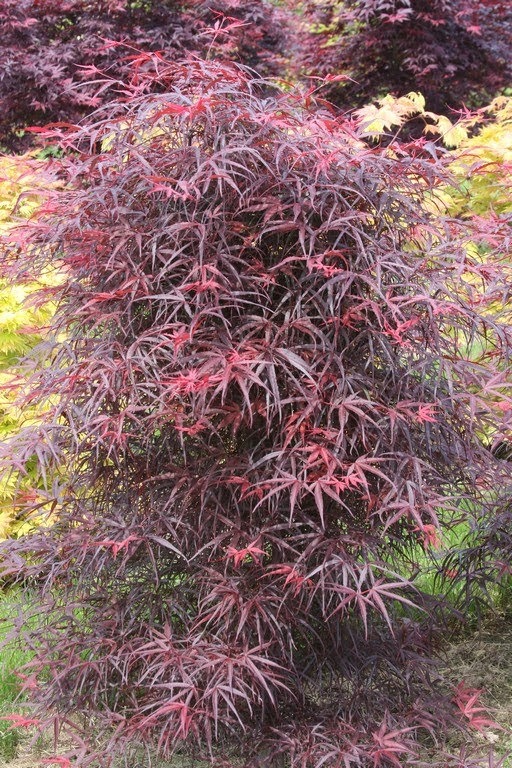 It entered the trade as 'Crimson Prince', but the twice-bankrupt New Zealand company was told that there was already a 'Crimson Prince' cultivar for a red upright palmatum. 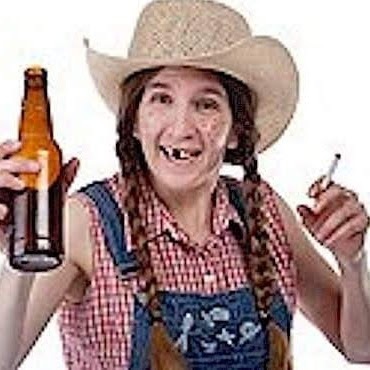 * So they changed the name to Princess, but today different American companies list it both ways. 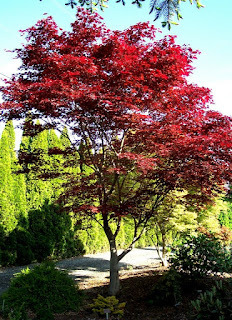 Actually, that was one of the goals of Vertrees' research: to straighten out the nomenclatural mess caused by careless Japanese, American and European horticulturists. Obviously it is an ongoing process because we're just as screwed up now as ever. *Supposedly originating as a seedling from A. p. 'Bloodgood', and introduced by Princeton Nurseries in 1988. Growing to 25' tall by 25' wide, perhaps Hillier should have included 'Prince' instead of 'Princess' for the top 96. Ten steps from my front door is an old specimen of A. p. 'Ornatum', planted by the previous owner. Like I often do, he planted it too close to the walkway and now I have to keep pruning it back. Hillier doesn't reveal much: “Leaves bronze-tinted. c 1867.” I don't dislike 'Ornatum', but I know that I could never sell it, and so it has never been propagated by Buchholz Nursery. It was an old European selection that has been known by a number of names such as 'Dissectum Ornatum', 'Ornatum Purpureum', 'Amatum', 'Spiderleaf' and others. 'Ornatum' is different and I guess deserving of cultivarhood, especially in 1867, but it wouldn't make my top 96. Probably I would rank it at 960. 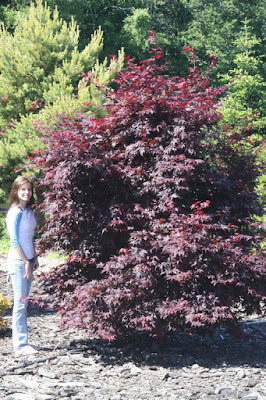 Honestly I'm not miffed that there aren't any Acer palmatum cultivars of mine that are included in their 96 choices. 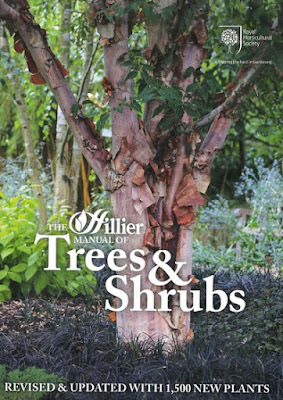 The latest (2014) edition of The Hillier Manual of Trees and Shrubs is published by the Royal Horticultural Society. 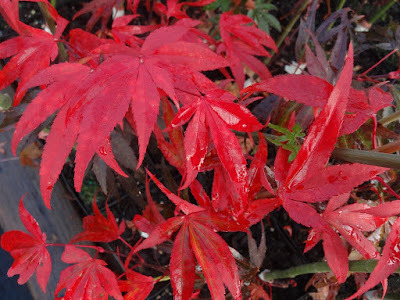 The editors, James Armitage, Dawn Edwards and Neil Lancaster, and the consultant editors John Hillier and Roy Lancaster are noted luminaries in the plant world, or at least in British horticulture. You can't blame them for not shoe-horning into the Manual a few more American or Japanese selections. They would say that the type can't get smaller, or more pages added to an already thick 567 paperback publication. If there are to be future Hillier editions it would be simple to contact the American Branch of the Maple Society and take a survey of the members' list of 96 most worthy Acer palmatum cultivars. 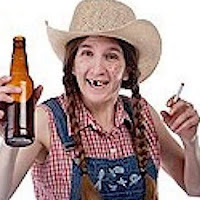 Then gather a few cognoscenti from Europe to select what are some from the 96 that are no longer horticulturally valid. Nobody enjoys more than I the “history” that can be gleaned from the Manual, but it could be made a little more relevant to the modern gardener. Go ahead - who cares! To critique your wife, daughter or girlfriend can be risky indeed, even if you are positive and sincere about it. 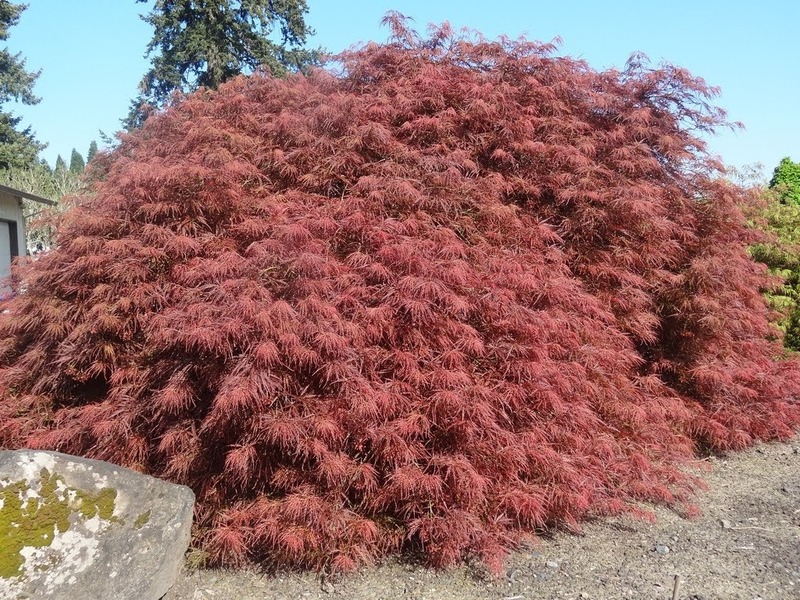 The RHS has earned its exalted position, and certainly does not need to defend itself from this finger-pointing Oregonian. I once mentioned to another nurseryman that I loved and practically worshipped the Manual, but that it does contain some mistakes. “Like what?” – he demanded to know. I fired back that the discoverer of Pinus contorta 'Chief Joseph' was Doug Will – not Wills, and that Dan Luscomb, not Don Luscombe, is raising seedlings from the recently discovered Xanthocyparis vietnamensis at Bedgeberry [sic]. The back cover of The Hillier Manual of Trees and Shrubs says, “Revised and fully updated.” No, not fully, it can never be complete. P.S. I didn't mean to cause alarm – nor was I looking for praise – when I said last week's blog might be the last. I was just coming to grips that Buchholz Nursery, The Flora Wonder Arboretum, The Flora Wonder Blog...and of course myself will eventually come to an end. But that hopefully you will continue beyond me, at least for a while more.